Burning inside the City limits of Snyder is regulated by City Ordinance. Violations are subject to citation(s). Click HERE to see what fires are permitted and what fires are prohibited. PLEASE CONTACT THE SNYDER FIRE DEPARTMENT BEFORE BURNING, as a courtesy to prevent an unnecessary response if someone else reports your fire. Outside the City limits, there are no local ordinances unless a burn ban is in place. (Click here to see current Burn Ban Status) However, the Texas Commission on Environmental Quality (TCEQ) has numerous restrictions and should be contacted for up-to-date and accurate information. In general, it is against State law to burn tires, furniture, petroleum products, certain treated materials including some types of wood, and several other materials. Trailer houses are specifically prohibited. Tree limbs, grass, and natural vegetation debris are normally allowed if produced on the property they are being burned on. Hauling debris to a secondary location is not allowed. During a routine burn ban, household trash burning is allowed in an enclosed container such as a barrel, as long as there is a spark arresting screen over the container. The screen should be small enough to catch sparks emitted from the burning process. Hog wire or chicken wire is not considered a spark arresting screen. A window-type screen material is suggested. Burning household trash in a pit is not allowed during a burn ban. The Texas Forest Service provides of map of counties under a burn ban. While this is a good reference, it is not always up to date as county governments implement and lift the burn ban on a daily basis, and occasionally this map is not accurate for every county. (C) Burning shall not be conducted during periods of actual or predicted persistent low level atmospheric temperature inversions. While these suggestions are normally acceptable, this list is not to be considered all-inclusive. Both the TCEQ and/or the County should be contacted for up-to-date, full, and accurate information regarding outdoor burning. While the Snyder Fire Department can assist in answering questions, the State and local burn ban laws are not enacted or enforced by the department. 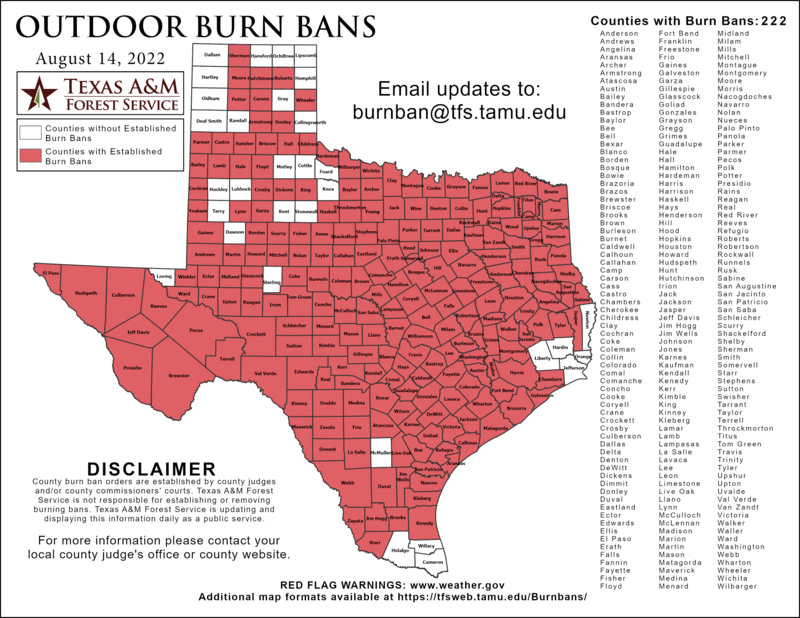 The State laws (TCEQ) and local burn ban laws (Scurry County) are enforced by their respective agencies and are subject to respective fines and penalties. The TCEQ can be contacted by phone at (512) 239-1000. Scurry County can be contacted by phone at (325) 573-8576.